Agricultural and livestock is the foundation of economy and the main source of income for over 80% of the population of Mali and therefore remains an important sector which cannot be ignored. Feed manufacturing or processing is the process of producing animal feed or “fodder” from raw agricultural products such as hay, straw, silage, compressed and pelleted feeds, oils, sprouted grains and legumes etc.. Fodder produced by manufacturing is formulated in order to meet the specific animal nutrition required for different species of animals at different life stages depending on their gender, breed and environment. The idea was to have a plant that could produce 25t of feed per day; 10t per day for poultry and 15t for cattle which will include protein, carbohydrates, vitamins and minerals.The feed would be made of the following ingredients: Corn, Barley, Feed and Meal Flax, Wheat flour, Wheat Bran, Powdered BONES, Salt, Powdered Fish, Rice Straw, Lentils Straw, beet Pulp, Clover, alfalfa, vitamin mixes and bread. These various ingredients will be blended smoothly and efficiently to ensure that every bite of the finished product has balanced nutrients. 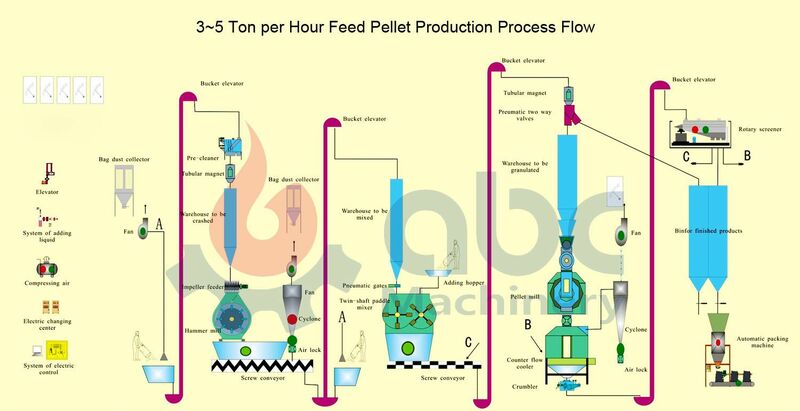 The main equipment of the animal feed pellet plant includes: 2 units of elevator, 2 units of crusher, 1 unit of animal feed pellet mill, 1 unit of mixer, 1 unit of screw conveyor and 1 unit of pellets cooler while other equipment include: draught fans, air lock, cyclone dust collectors, electronic control devices, electric wires etc. The plants are based on an easy to use design which can also be customized so fit different and special requirements. Repairing and training opportunity ensure the production of high quality animal feed for the poultry and livestock.